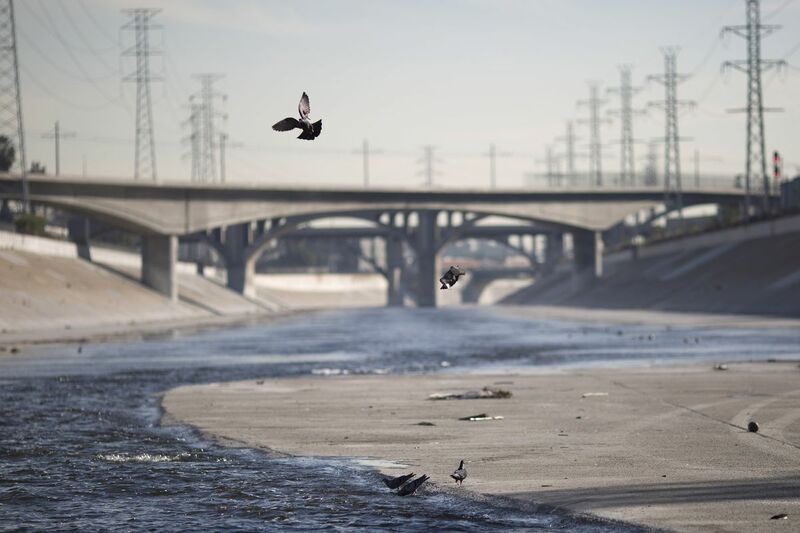 Today, the LA River is an “oddball” mash-up of concrete and nature. 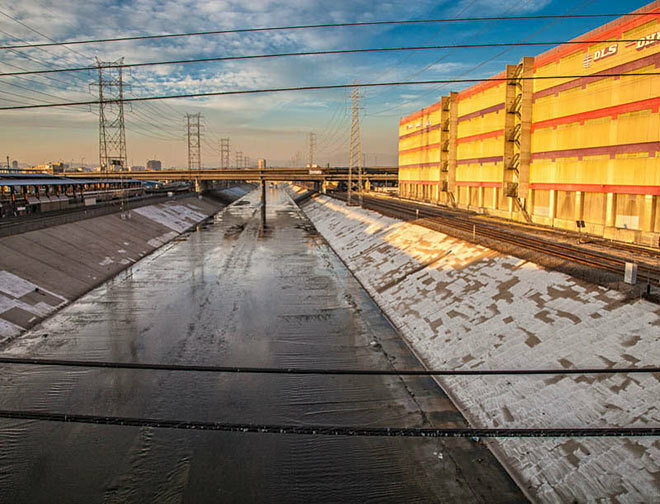 The Los Angeles River is on the verge of a new era. 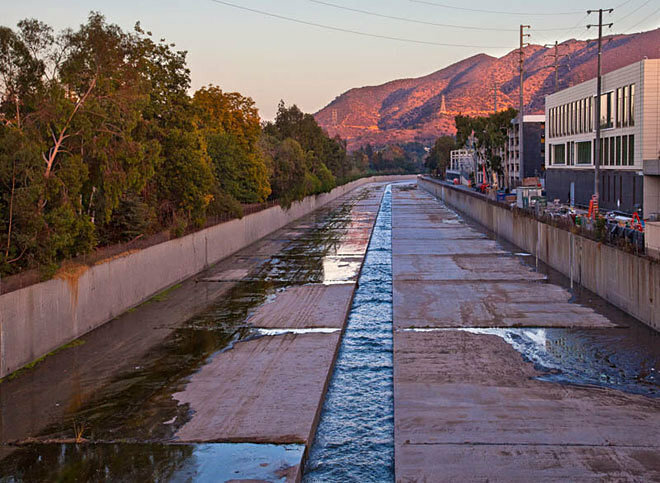 In the few years since the flood control channel was reclassified as a “navigable waterway,” the region has re-embraced its oddball amalgam of concrete and nature, which winds roughly 51 miles from the San Fernando Valley out to the ocean in Long Beach. 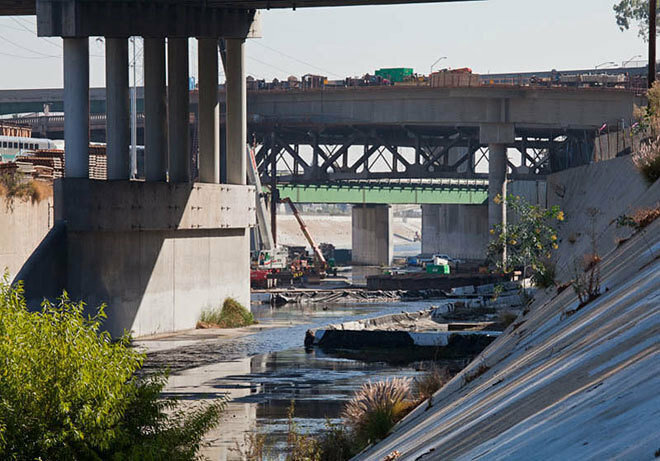 A $1-billion-plus plan to restore 11 miles north of Downtown LA is (slowly) working its way through federal approvals. 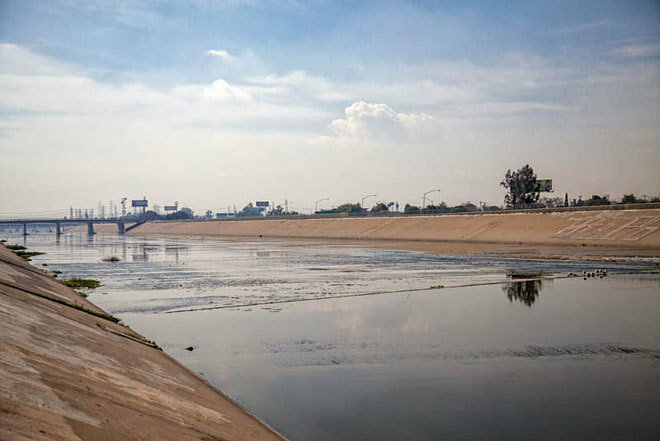 Famed architect Frank Gehry is working with Los Angeles County officials and numerous nonprofits and stakeholder groups to create a comprehensive plan for the whole river. The river was one of the selling points in the city’s winning bid for the 2028 Olympics. Developers are still clamoring to build along the river’s banks. 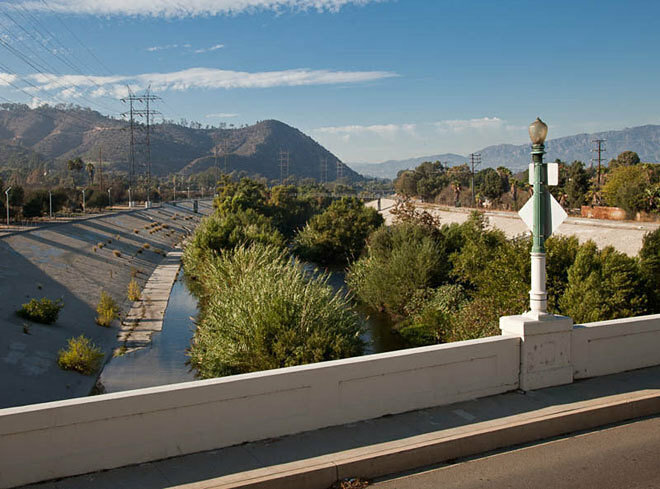 The last time the LA River was reborn it was the late 1930s, and it had been drowning the young city periodically since its birth. 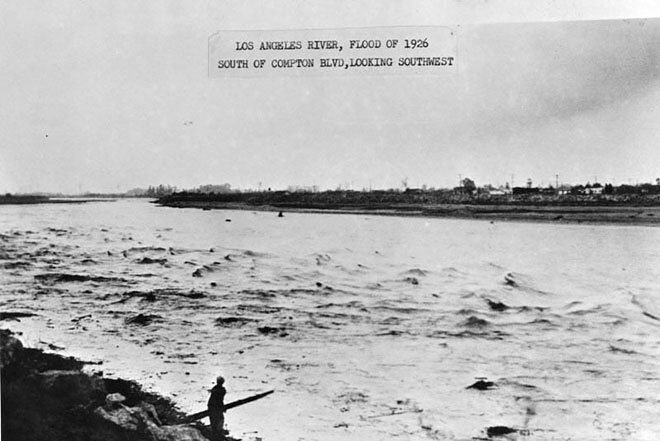 At some points, the river was just a trickle; in other parts, it was uncontrollably wild, and flooded frequently and devastatingly. 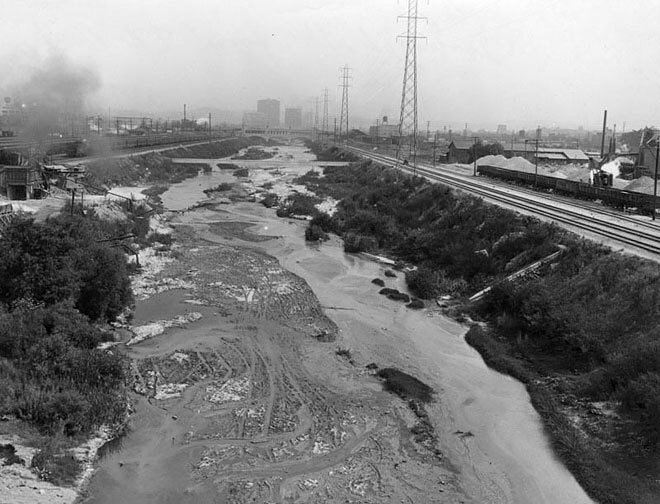 After a terrible flood in March 1938, the U.S. Army Corps of Engineers began work to lower the riverbed, widen the channel, and choke the whole thing in “a continuous trapezoidal concrete channel to carry the river from Elysian Park to Long Beach,” as described in The Los Angeles River: Its Life, Death, and Possible Rebirth. 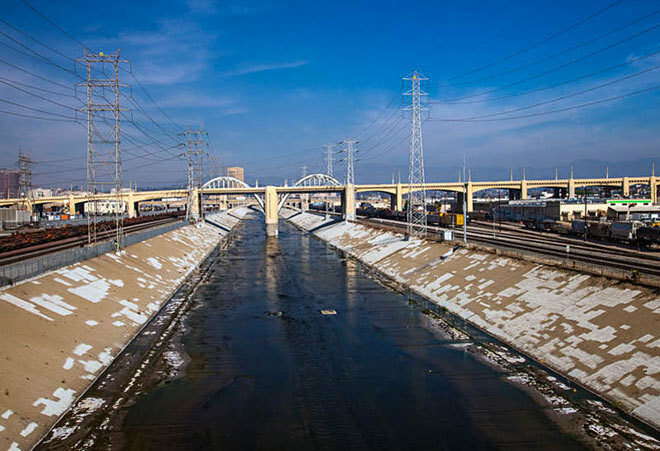 Gehry thinks the LA River can be great again with its concrete still intact; the Army Corps aims to remove at least some of it. The idea was to get as close to the original spot the older photos were taken, and try to match up the lens and framing with the original… There was a sense of time travel as I viewed the landscape as it is today and... as it was back in the ’30s. The visual contrast was quite striking, and the changes apparent in the 75 years or so since the photos were taken was at times quite dramatic. Below, the two versions are matched together, along with Bennett’s notes, so you can take the trip yourself. 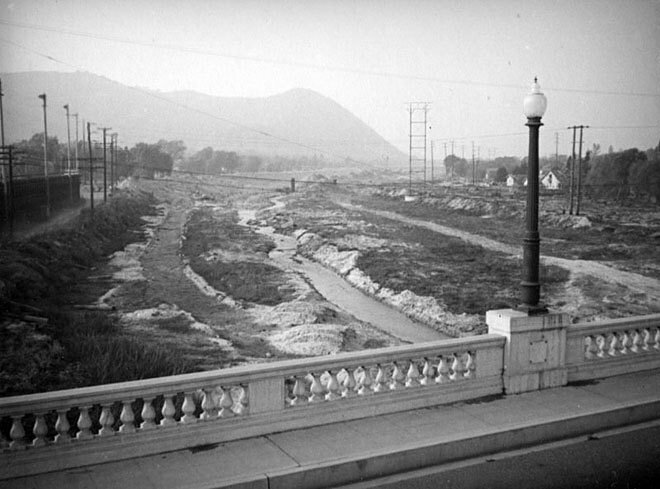 (Left) View from the Glendale/Hyperion Bridge circa 1937. (Right) In 2015. (Left) Compton Avenue, 1926; (right) in 2015. 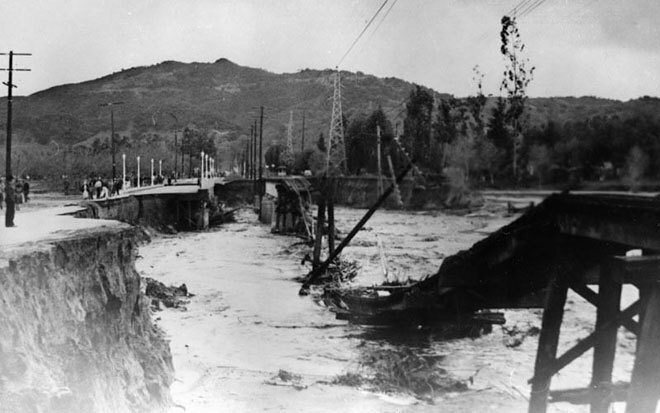 (Left) A washed-out Vineland Avenue in 1933. (Right) In 2015. 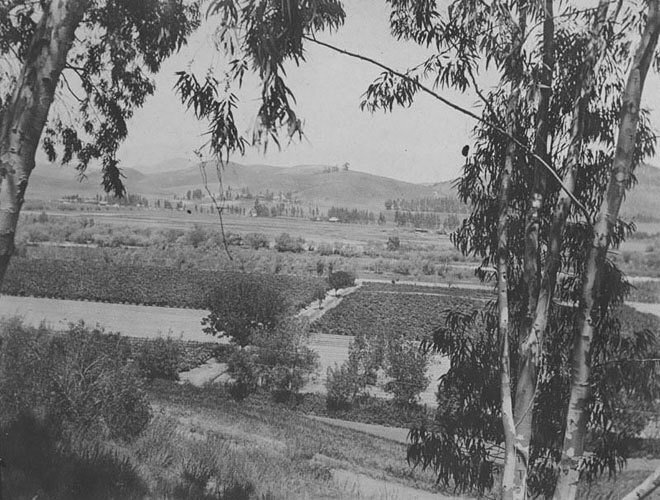 (Left) Photo taken from Elysian Park, looking toward Cypress and Glassell Parks, circa 1898. (Right) In 2015. 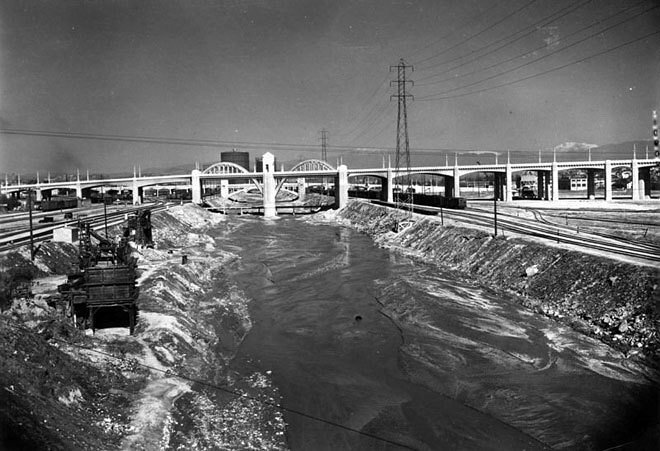 (Left) Looking north from the Olympic Viaduct, circa 1938. (Right) In 2015. 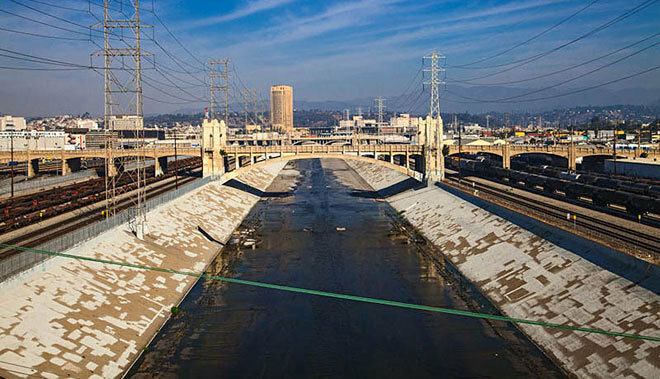 “The photos of the Downtown bridges are interesting as you can really contrast the original unpaved river with the paved version that we are familiar with today. 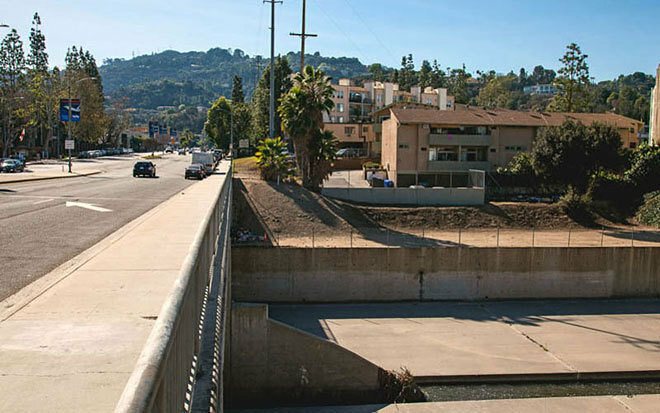 The photo [previously] labeled looking north from the Seventh Street Viaduct was actually taken from the Olympic Boulevard Viaduct, and while you can see the Seventh Street Viaduct in the distance. Today that view is blocked by the 10 Freeway." 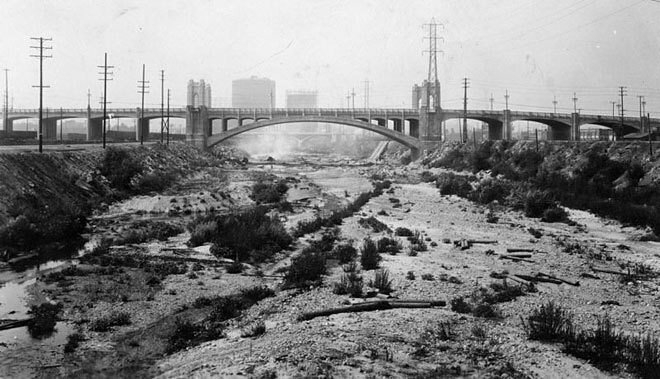 (Left) The then-new Fourth Street Bridge in 1931. (Right) In 2015. 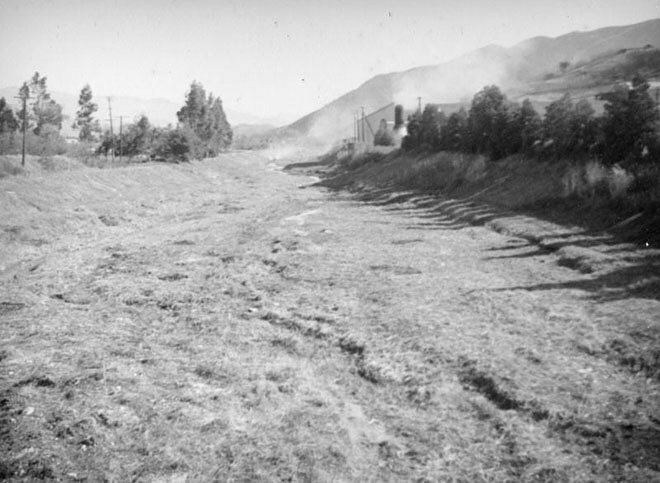 (Left) An almost completely dry section in Studio City circa 1937. (Right) In 2015. 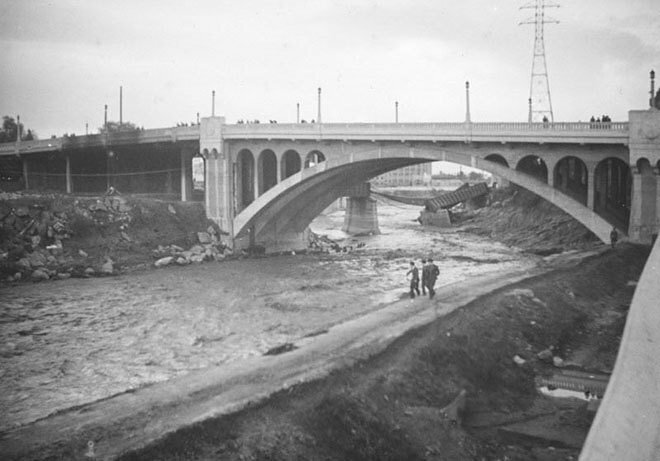 (Left) The Dayton Avenue Bridge circa 1938. (Right) In 2015. Beachwood Canyon cabin with views of the Hollywood Sign seeks $975K The century-old structure has vaulted ceilings and an antique stove. 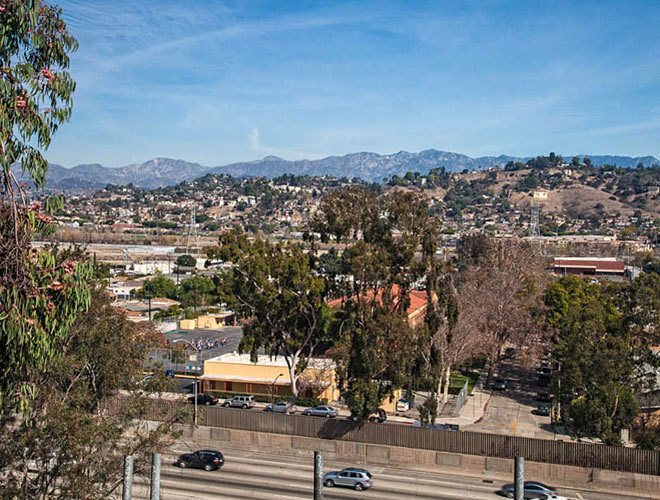 Three-bedroom condo with skyline views asks $749,000 in Silver Lake Located just off Sunset Boulevard, it comes with concrete floors, a fireplace, and spacious patio. 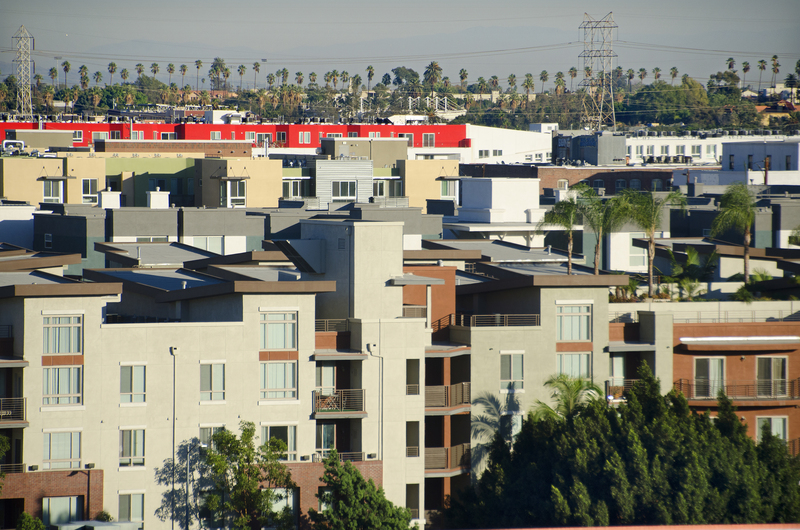 California voters could decide to expand rent control in 2020 The Los Angeles-based AIDS Healthcare Foundation is back with another rent control initiative. 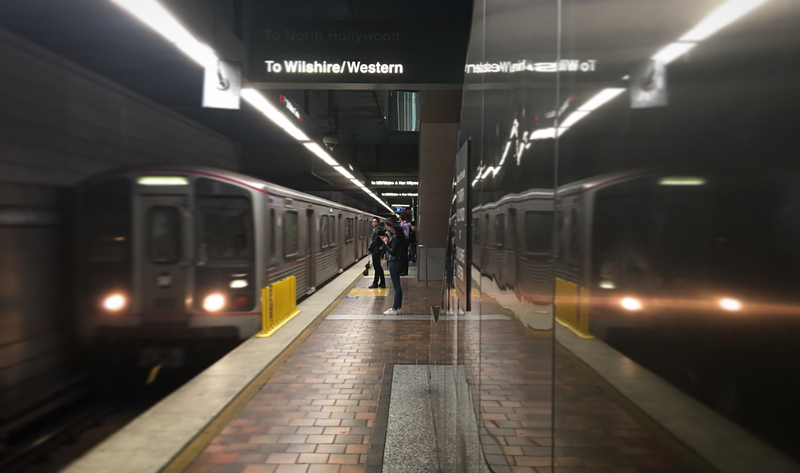 Metro gets federal ‘guarantee’ for key funding for Purple Line extension to Westside But it’s still waiting on the $1.3 billion. Hollywood’s wild development boom, mapped From the Amoeba tower to the many planned hotels, these 30-plus projects are in the works right now. This Article has a component height of 92. The sidebar size is long. The century-old structure has vaulted ceilings and an antique stove. 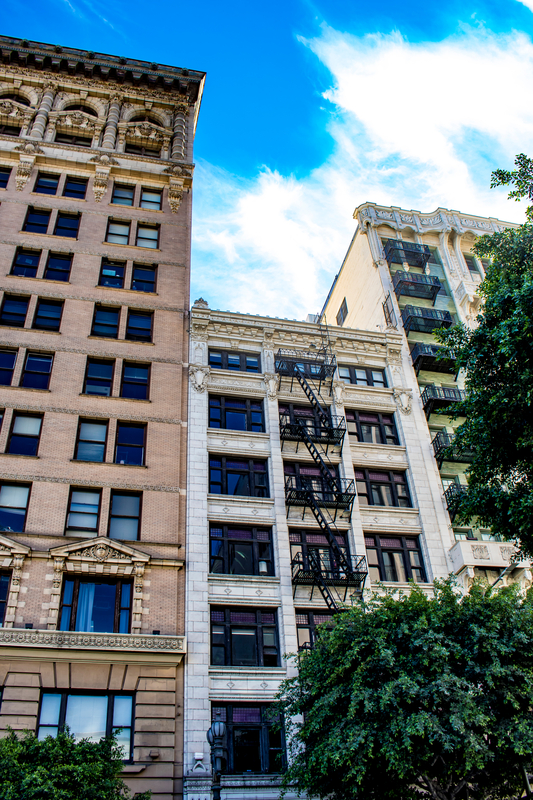 The Los Angeles-based AIDS Healthcare Foundation is back with another rent control initiative. But it’s still waiting on the $1.3 billion. The Historic Core’s Continental Building was converted to lofts in the early 2000s. New plans call for 140 guest rooms and a rooftop bar with outdoor dining. Located just off Sunset Boulevard, it comes with concrete floors, a fireplace, and spacious patio. Situated on a corner lot, this 1940s home has updated interiors and a comfy backyard deck.